Prostate cancer is the most common male cancer in the world. The diagnosis, staging, prognosis and monitoring are usually done with Prostate Specific Antigen (PSA). Biosensors are emerging as a novel analytical technology for PSA detection. They provide several advantages for clinical applications and will benefit clinicians, patients and forensic workers in the future. Among them, electrochemical immunosensors have gained growing interests. Hence, their sensitivity is often improved by modifying them with nanoparticles especially iron oxide (IONP). Functionalized IONP attracted much attention in the fabrication of biosensing systems, due to their multiple properties, such as biocompatibility and signal amplification, and their ability to bind covalently to antibodies via their functional groups. In the present study, two electrochemical immunosensors were investigated for PSA detection. The first one was functionalized with 3- glycidoxypropyltrimethoxysilane self-assembled monolayer, while the second one was based on iron oxide nanoparticles functionalized with 3-aminopropyltriethoxysilane. Square wave voltammetry (SWV) has been investigated to follow-up the PSA detection in a phosphate buffer solution, in an artificial serum and in a human serum. The limit of detection (LOD) of both immunosensors was found of order of 10 fg/ml. When estimated in human serum this value increases up to 50 pg/ml. Keywords: Prostate cancer, Prostate specific antigen, Electrochemical immunosensor, Self assembled monolayer, Iron oxide nanoparticles, Square wave voltammetry, Electrochemical impedance spectroscopy. Keywords:Prostate cancer, Prostate specific antigen, Electrochemical immunosensor, Self assembled monolayer, Iron oxide nanoparticles, Square wave voltammetry, Electrochemical impedance spectroscopy. Abstract:Prostate cancer is the most common male cancer in the world. The diagnosis, staging, prognosis and monitoring are usually done with Prostate Specific Antigen (PSA). Biosensors are emerging as a novel analytical technology for PSA detection. They provide several advantages for clinical applications and will benefit clinicians, patients and forensic workers in the future. Among them, electrochemical immunosensors have gained growing interests. Hence, their sensitivity is often improved by modifying them with nanoparticles especially iron oxide (IONP). 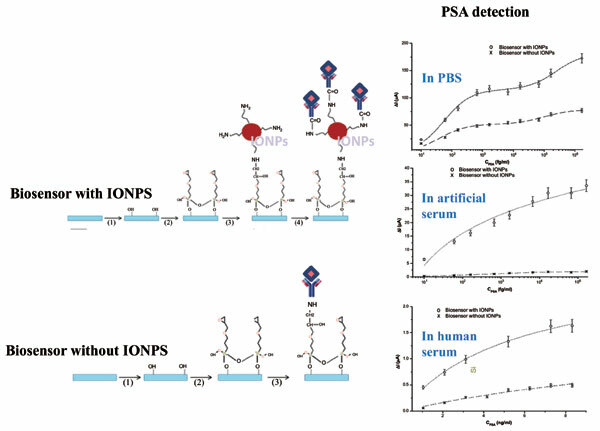 Functionalized IONP attracted much attention in the fabrication of biosensing systems, due to their multiple properties, such as biocompatibility and signal amplification, and their ability to bind covalently to antibodies via their functional groups. In the present study, two electrochemical immunosensors were investigated for PSA detection. The first one was functionalized with 3- glycidoxypropyltrimethoxysilane self-assembled monolayer, while the second one was based on iron oxide nanoparticles functionalized with 3-aminopropyltriethoxysilane. Square wave voltammetry (SWV) has been investigated to follow-up the PSA detection in a phosphate buffer solution, in an artificial serum and in a human serum. The limit of detection (LOD) of both immunosensors was found of order of 10 fg/ml. When estimated in human serum this value increases up to 50 pg/ml.